Officials helped celebrate the construction required for the Trans Mountain Expansion Project last week with a special Enoch Cree blessing ceremony. Enoch Cree Nation Chief William (Billy) Morin welcomed Kinder Morgan Canada President Ian Anderson, Alberta Premier Rachel Notley and Natural Resources Minister Amarjeet Sohi for a blessing ceremony and ground-breaking event for the Enoch Cree Stockpile Site that will be used for the Expansion Project. “We are proud of the relationship we have built with Trans Mountain and to partner with them on this project. 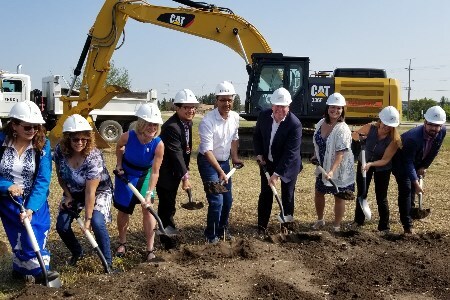 This worksite will allow us to create opportunities for our people and community for many years to come,” says Enoch Cree Nation Chief Billy Morin, who adds the Nation plans on using the site improvements to kick-off their industrial subdivision. Trans Mountain will store all of the construction materials and equipment for Spread 1 on the Enoch Cree Stockpile Site, including pipe, fittings, valves, bends and other materials needed for the Expansion Project. Spread 1 is approximately 50 km and commences at Trans Mountain’s Edmonton Storage Terminal east of the City of Edmonton in Strathcona County, and terminates west of the City at Highway 60 south of Acheson. “[The] blessing is an important step forward in the construction of the Trans Mountain Expansion Project. It demonstrates just how integral our Indigenous communities are to the success of this pipeline and Alberta and Canada’s economic future. With this blessing, construction for the Enoch Cree Stockpile Site can begin and we move that much closer to getting this pipeline built,” says Premier Rachel Notley. “Canada is a place where the environment and the economy go hand in hand, and where projects that are in the national interest get built. The blessing received today is an important milestone in the ongoing construction of this project,” says Amarjeet Sohi, Minister of Natural Resources and MP for Edmonton Mill Woods. Trans Mountain filed a six month outlook summary schedule with the National Energy Board on 3 July 2018 outlining construction activities planned for the remainder of 2018. Construction has been underway on the Expansion Project for the past 10 months at the Westridge Marine Terminal in Burnaby, and work is underway and will continue in 2018 along the entire pipeline route to develop temporary infrastructure sites such as stockpile sites, construction yards and camps. Construction will begin in Spread 2 in Central Alberta in August 2018, including clearing of trees and vegetation, as well as measures to protect the environment, such as weed control, relocation of any rare plants and wildlife surveys. Spread 2 includes approximately 290 km of pipeline between Edmonton and Jasper National Park in Alberta. Trans Mountain has developed plans for avoiding or reducing environmental effects of land clearing and worksite preparation. Environmental Inspectors will be on site to monitor and enforce a wide range of mitigation measures and techniques included in the Environmental Protection Plans. Construction will begin in the North Thompson region of B.C. in late September. Additional construction is planned in the Lower Mainland of B.C. and the work at Westridge Marine Terminal in Burnaby, that has been underway since September 2017, will continue. Since the federal government’s announcement on 29 May 2018 to purchase the Trans Mountain Pipeline system and the Expansion Project, Trans Mountain has been moving forward with construction planning on the Project and working to update the construction timeline. Progress has been made on preparation activities, receiving materials, seeking permits, meeting conditions, signing employment and procurement contracts, refining engineering designs, and notifying neighbours and stakeholders about upcoming construction activities. These are all important steps in the process that need to occur before ‘boots-on-the-ground’ construction can begin. Image courtesy of Trans Mountain.